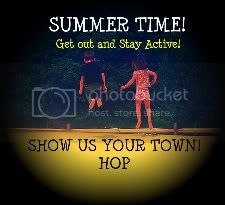 Welcome to another week of the Show Us Your Town Hopwhere you get to share some of your local gems with us! Hi! Happy to find this linky. Hope you don't mind if I changed up the banner a bit on my post. I wanted to keep the graphics bright...so I turned it lime green *grin*. Of course if you like it you're welcomed to use it as a secondary button or whatever. I can easily make it into other colors so if if there's a color you'ld like to try let me know. Man, I need to start joining this more often. I've got many places in mind...just keep forgetting to even blog them for my own blog.